Sequestration has decreased the pool of grant money available from federal institutions like the National Institutes of Health and the National Science Foundation, which in turn increases the number of researchers competing for other funding sources. 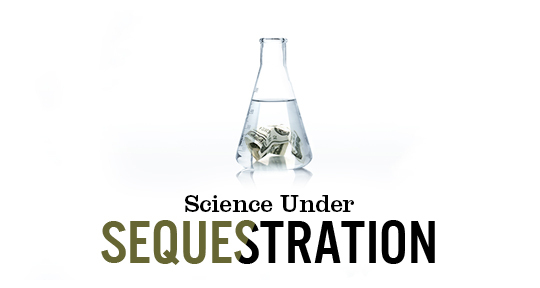 Yale professor Lawrence Rizzolo, Ph.D., discusses this and other downstream impacts of sequestration in an interview with AAAS MemberCentral. AAAS MemberCentral: Please briefly describe your lab's research interests. Lawrence Rizzolo, Ph.D., Associate Professor of Surgery at Yale University: I am an epithelial cell biologist who is interested in tissue interactions in the eye. The retinal pigment epithelium (RPE) forms the outer blood retinal barrier by separating the photosensitive layer of the retina from its blood supply in the choroid. My lab has demonstrated how these neighboring tissues affect gene expression and barrier function in the RPE. I believe these tissue-tissue interactions lie at the heart of debilitating diseases such as age-related muscular degeneration. We are using human stem cells to engineer a three-dimensional culture model to study the mechanism of these interactions, develop therapeutic agents that might augment or replace transplantation therapy, and develop next-generation tissues for transplantation that address the shortcomings of therapies currently in clinical trials. AAAS MC: How has sequestration impacted your lab's funding? Rizzolo: Sequestration has had real, albeit indirect, effects on the funding of my lab. It is important to appreciate that NIH has been flat-funded for a decade, which has made the competition for NIH grants exceptionally intense even before sequestration. For Connecticut researchers, the opening of the Connecticut Stem Cell Fund offered a new mechanism for obtaining funding comparable to an NIH grant. Connecticut funding helped my successful, productive transition to stem cell research, whereas NIH was too conservative to support a project with minimal preliminary data. The Connecticut program has been successful in attracting many other researchers to this field, but sequestration has driven even more researchers into this applicant pool. Consequently, the funding-success rate has become as low as NIH. As it happens, my recent application just missed the payline. NIH is now considering my proposal at a time when the effects of sequestration are coming into full force. The second problem is that neighboring labs have lost funding, which places more pressure on funded labs to cover the costs of Departmental service contracts. AAAS MC: What impact has this decreased funding had on your lab, its members, and your research? Rizzolo: Even though my stem cell/tissue engineering project is taking off, I am forced to reduce the size of the lab by attrition. Consequently, research has slowed. I am attracting outstanding postdoc applications, but I have to turn them down. As I approach the age of early retirement, I am considering closing my lab. Even if funding is ultimately restored, a skilled research team will have been dissolved and it would take time to re-establish an equally skilled team. The investment that the Connecticut Stem Cell Fund has made in my lab would be lost. AAAS MC: How has sequestration affected your university? Your field/colleagues? Rizzolo: NIH's investment in research has already been lost in other productive labs that have closed prematurely at my institution. Yale has done very well this past decade relative to many institutions. A decade of growth has expanded our infrastructure for research, but now it is difficult to recruit researchers to fill the available space. The growth in research grants has leveled off and there are fears of contraction. Departments have always considered the prospects for future funding when making promotions and new appointments, but the concerns have become heightened. Funds have to be in hand before long term commitments are made. Historically, most faculty members of the medical school are on 5-year renewable contracts. More and more, contracts are renewed for only 3 years pending grant support for the entire 5-year period. AAAS MC: Do you think sequestration will having a lasting impact on scientific research in the U.S.? If so, how do you think science will change? Rizzolo: There is no question that flat funding for the NIH this past decade has discouraged American students from considering a career in science. The evidence can be seen by simply walking down the hall and counting the percentage of American versus foreign students and postdocs. Non-research careers are becoming more common for finishing postdocs and more postdocs are returning to their native land. In a sense, we are developing the research capabilities of foreign nations at the expense of our own. Prior to sequestration, funding at NIH was coming to resemble a lottery for highly qualified applicants. With insufficient funding for all meritorious grants, there is a good chance that successful research programs would be slowed or closed prematurely. Sequestration only makes this worse. It is hard to keep a quality research team intact, when funding for quality work becomes so unstable. When NIH's budget was doubled over a 5-year period a decade ago, a similar crisis of funding instability was resolved. The increase allowed labs to expand, which generated an increase of new scientists. With flat funding and sequestration, there is insufficient support to sustain the fruits of this productive investment. With sequestration, I fear a generation of researchers will be lost, and we will find ourselves in the same desperate straits of two decades ago. It is so sad that Congress's past investment in NIH and NSF had such a high return, and yet Congress is now so intent on prematurely terminating that return on investment. How is this sound economic policy?